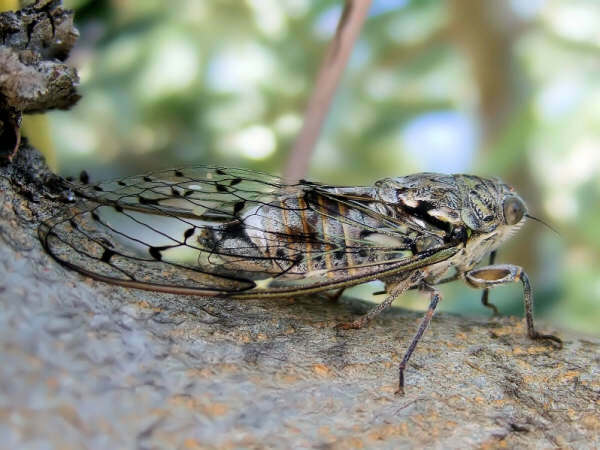 Cicada pallida Goeze, 1778, is a cicada found in Mexico. Head pale greenish, with two small transverse spots on center of front, two larger ones near inner margins of eyes, and two large lunate spots, partly surrounding the two posterior ocelli, black. Pronotum pale greenish and unicolorous. Mesonotum ochraceous, with two large obconical spots commencing on anterior margin, on each side of these a smaller and more oblique spot of the same description, a broken submarginal longitudinal fascia, and two small rounded spots on posterior portion of disk fuscous. Abdomen above ochraceous. Head beneath pale greenish. 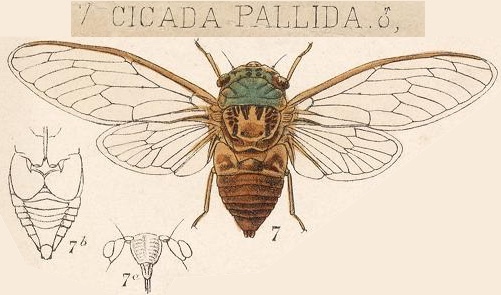 Sternum, legs, opercula, and underside of abdomen ochraceous. Tegmina pale hyaline; venation of about basal two thirds ochraceous, that of apical third fuscous. Wings pale hyaline; basal half of venation ochraceous, apical half fuscous. The face is large, robust, and convex, faintly transversely striate, and with a faint central raised longitudinal line. Opercula rounded, divergent, meeting only at anterior angles, posteriorly reaching apex of first abdominal segment. Tympana somewhat large and prominent. The body alone is sparingly pilose, the frenum most densely so.